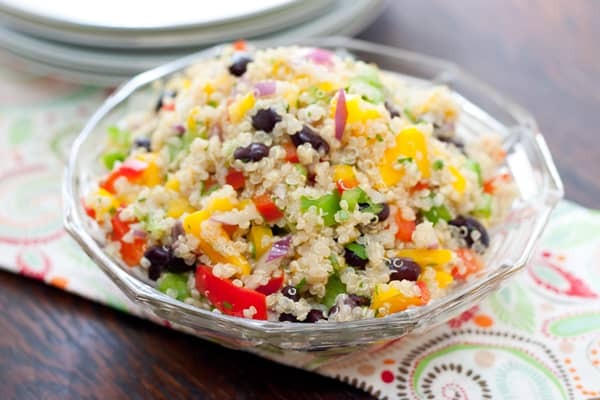 Here is another delicious and easy quinoa salad recipe. This one has black beans, mangos, green and red peppers, red onions and cilantro. It’s a great salad for summer. I have really fallen in love with quinoa. I have tried other grains, but quinoa is my favorite. The next new one I wanted to try was farro, but that will require a special trip to Whole Foods. My son also started day care this week. Well, gym daycare at least. I guess you could also call it kiddie gym. He stays in there all of an hour. On our first visit, he was overly excited, and had real tears when we left. I think he wanted to stay all night. On the second visit, he had a toddler tantrum when it was time to go, but settled down when he knew he could come back the next day. The third time was just as bad. We are going again tonight for a yoga class, and anticipate the same tantrum when we go to leave. I don’t know why we took so long to get back into going to the gym since I had our son, but am happy we are back to going again. I already feel better, and hope I can shed a few, post baby weaning pounds pretty fast. All my baby weight fell off pretty fast. However, after weaning, I started putting on the pounds, fast. It was something I was unprepared for, so I have a little work to do. I love the color in this salad. Great flavors too! Angie this is such a pretty salad! We love quinoa over at my house!! I just made a quinoa salad this past weekend with black beans, zucchini, jalapenos and corn! It is so easy and so filling! What a colorful salad! Quinoa is one of my go-to grains (just made it for lunch yesterday) and I’m always looking for new ways to prepare it. Wow it looks so colorful and beautiful. I just started eating quinoa, in the country I’m from (Poland) we don’t even have that so I’ve never ate it until I moved to US. I love quinoa and I’m looking for ways to eat it, this one seems super yummy. angie, this is positively gorgeous. those confetti-like colors are so lovely, and don’t even get me started on all the awesome flavors! When I saw this on my reader, I knew it had to be good. Black beans, quinoa and mango…delicious. I’m glad you are getting back to the gym…it feels so good to be able to do that after being away for awhile. I hope that tonight was a good night for you and your little guy! Angie, this photo and recipe looks fabulous. It has all the ingredients that I so love — a very colorful dish. Not only is this good for summer, but I know that it would be appreciated as well all year long. This is such a beautiful quinoa recipe! Love the addition of sweet mango. This is great for entertaining. A very elegant and delicious colorful salad! Love the mango in it! Thanks for the great quinoa recipe, I’m always looking for new ways to prepare it. Funny, at least your son likes the gym. I had to quit because mine would cry and they would call me after 10 min every single time. Lovely salad. I always toast quinoa in a dry pan before I cook it with water. It gives a nice nutty flavor. how very pretty! Colors are great! I’m such a fan of quinoa. It’s so healthy for you and has such a tender texture. Lovely salad! What a beautiful salad! And it sounds delicious too! Looks quite delicious and very beautiful. Quinoa is one of the prettiest foods to photograph! Love this post. Wow, yum! I love quinoa salads. This is fresh and looks so tasty. this was wonderful salad, made it last night for our monthly supper club. i did sub in nectarine for the mango, as that was what i had on hand. worked out wonderfully! This is so pretty. I just can’t get enough quinoa. Mangoes and black beans are a twist I will try soon. I agree with Alison that quinoa is one of the prettiest foods to photograph.